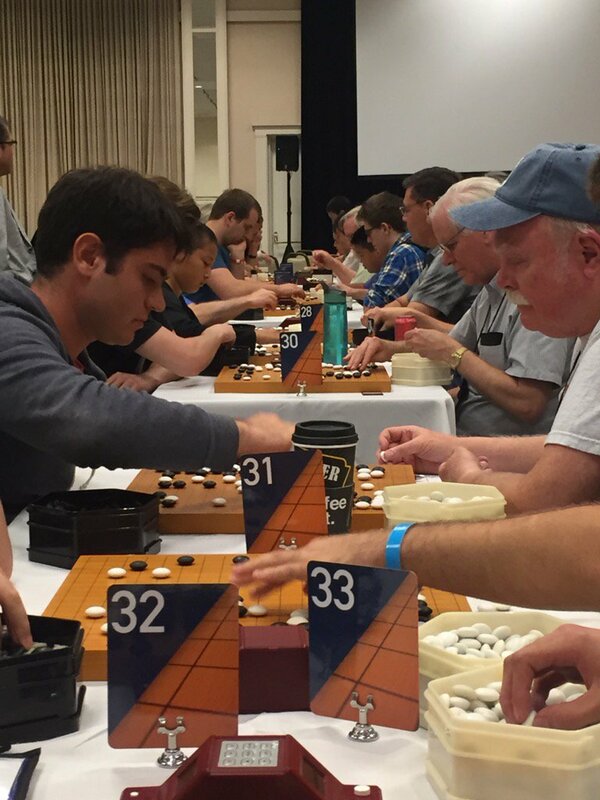 The main playing area at the Go Congress is usually a scene of quiet concentration. Not Monday night, when it was a cacophony of slammed stones, slapped clocks and raucous laughter as go players tried desperately to play coherent games with only 10 minutes of basic time and sudden death. TD Keith Arnold extended a special thanks to Mark Nahabedian for graciously bowing out of the tournament to make an even number of players. See our full story on this year’s Lightning Tournament and a behind-the-scenes profile of TD Keith Arnold. Table winners: Yom Nonaka 5d, Tanimiya Yuichi 5d, Zhaoting Han 5d, David Glekel 4d, Konrad Scheffler 2d, Boris Bernadsky 1d, Noah Doss 1k, Jim Fienup 3k, Luke Belyeu 4k, Caleb Johnson 6k, David Baran 8k, Zougren Huang 20k.